More and more people are trying their hands at growing potatoes in their backyard. Potatoes are one of the easiest vegetables to grow. 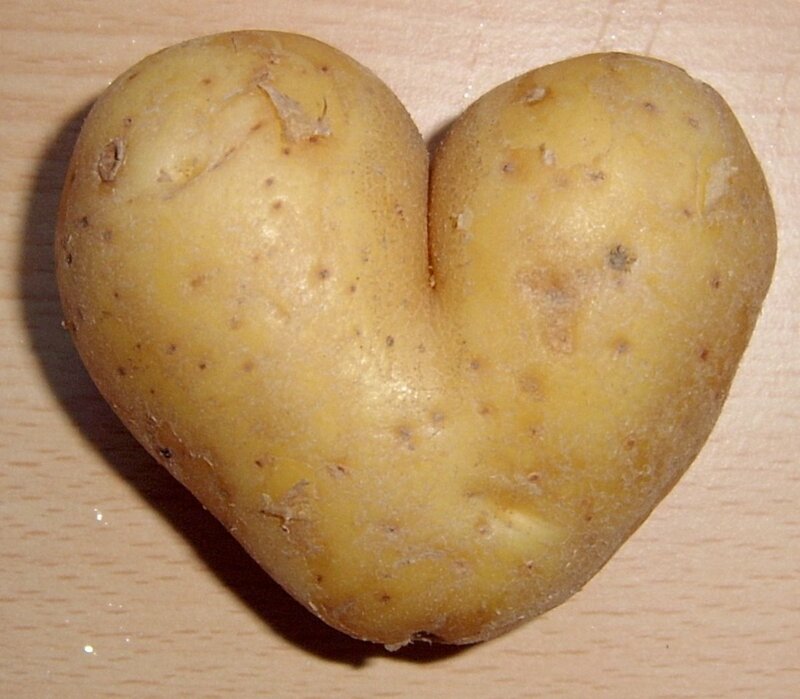 When grown intensively, potatoes can produce more calories per square food than any other vegetable. Potatoes are not usually grown from seeds, but can be harvested year after year from potatoes that were harvested in previous year's potato crop. Q. When is the right time to plant—is there a cue in nature to remind us, or a soil temperature or calendar date we’re looking for? Plant your potatoes as early in the spring as possible. Ideally you should plant your potatoes two to three weeks before your average last frost in the spring. It is possible for seed potatoes to rot too early if planted in cold wet soil. Your potato plants will get damaged if the young shoots are exposed to heavy frost. They will put out new shoots, but with each die back, the plants will produce a later, smaller harvest. It is better to wait until the soil has warmed somewhat before planting. Potatoes planted two to three weeks before the frost date will actually produce faster than potatoes planted four to six weeks before the final frost date.In the south however, potatoes may be better if planted in late fall or early winter. A good way to determine when to plant potatoes is to determine when the first dandelion blooms after the snow has melted off.Plant your potatoes at that time. Cut your larger sized-seed potatoes into pieces so that your seed potatoes will go further and are likely to produce a higher yield.. Be sure to leave at least two "eyes" on each piece and cut with a sharp knife. Leave cut pieces in a cool humid location overnight to harden the cuts and prevent spoilage before potatoes grow. If you discover that your seed potatoes are susceptible to worm damage, such as wireworms, maggots or other pests, avoid cutting potatoes and just plant them whole. 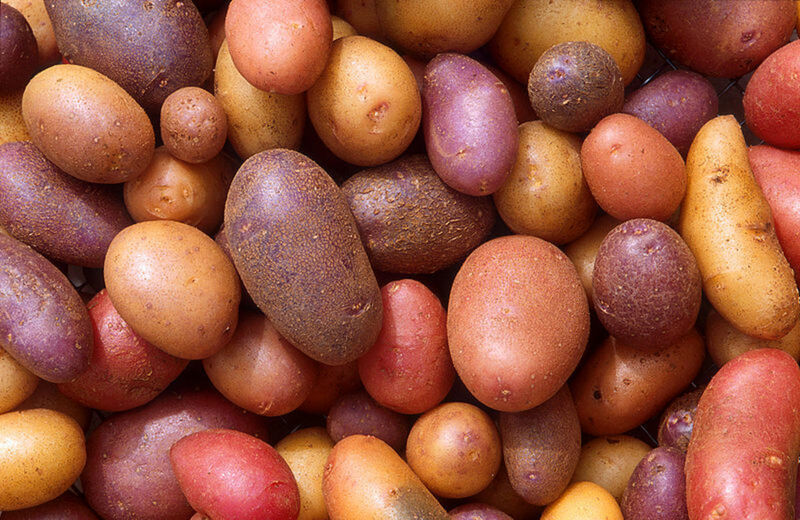 If you have a chance to hand pick your own seed potatoes, choose small potatoes so that you have more potatoes to plant. If you have deep loamy soil, plant your potatoes about 4 inches deep and then hill at the proper time (more about that later). If however your soil is not ideal there are a number of ways to prepare your soil to improve your potato yield. Incorporate as much organic material into your soil in order to produce the best yields. It is best to add the compost or other organic material in the fall so that the soil has time to balance itself. Avoid using fresh manure because it can cause scab on the potatoes. Therefore, use only aged manure into soil where potatoes are to be planted.Avoid adding too much nitrogen as this will delay potato production and will give you lots of potato leaves but very few potatoes. Dig a shallow trench about 6-8 inches deep using a hoe or garden rake. Place potatoes in trench about 10-12 inches apart. Space rows about 36 inches apart or wider if you intend to hill them. cover plants with about 3-4 inches of soil leaving some depth to the trench. Should I Hill Or Deep Mulch Potatoes? When your potato plants are about 8 inches high, bring the soil up around the plants on both sides. Do this with a rake or a hoe.When cultivating around plants, be careful not to disturb the plant rots as it can damage roots. 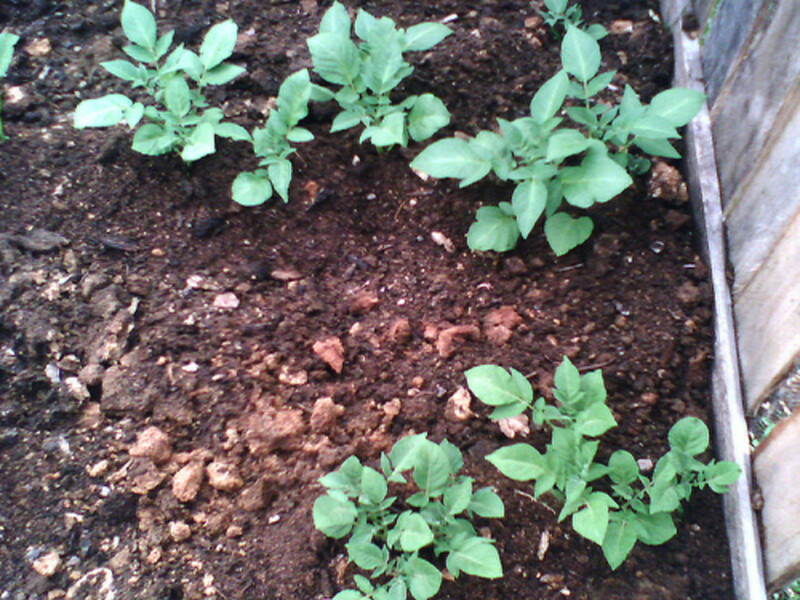 Hilling brings loose soil up around the potatoes so that they are able to form potatoes in cool loose soil. With your first hilling, bring hills only up to the point that levels the trench that you dug to begin with. In two to three weeks, hill again bringing the hill up 4 inches above the original ground level. If your soil is hard, instead of bringing the soil up around the plants, you can instead apply a deep well rotted mulch to the soil mixed with as much compost as you can spare. As the potatoes grow and after the second hilling, add mulch of straw or well rotted (at least 2 years old) sawdust. The mulch will allow the soil to breath. Autumn leaves can also be used if they are shredded before using. The mulch will not only keep the soil cooler and moister, but will also prevent potato beetles from being a problem because it provides a barrier and gives haven to insects that eat beetle larvae. You can start harvesting "new potatoes" a few weeks after the plants begin flowering. Dig into the loose soil that you hilled and gently pull out these thin-skinned potatoes.Gently remove them from the plant to avoid harming the plants development and further potato development. To control soil borne diseases and pests, plant mustard greens into areas in the fall where potatoes were grown that spring. Enjoy the greens from these plants in the late fall and winter and/or early spring. This is an inexpensive alternative to expensive fumigants used by farmers who grow potatoes. Many potato farmers have found an 86% improvement in the quality of tubers when potatoes are rotated with mustard greens. Also, if possible, avoid planting potatoes, tomatoes, or peppers in the same ground the following year as they are closely related plants. You May Never Buy Store-bought Potatoes Again! Try growing a small patch of potatoes this year in your vegetable garden. Discover how easy it really is to grow the best tasting potatoes you have ever eaten. 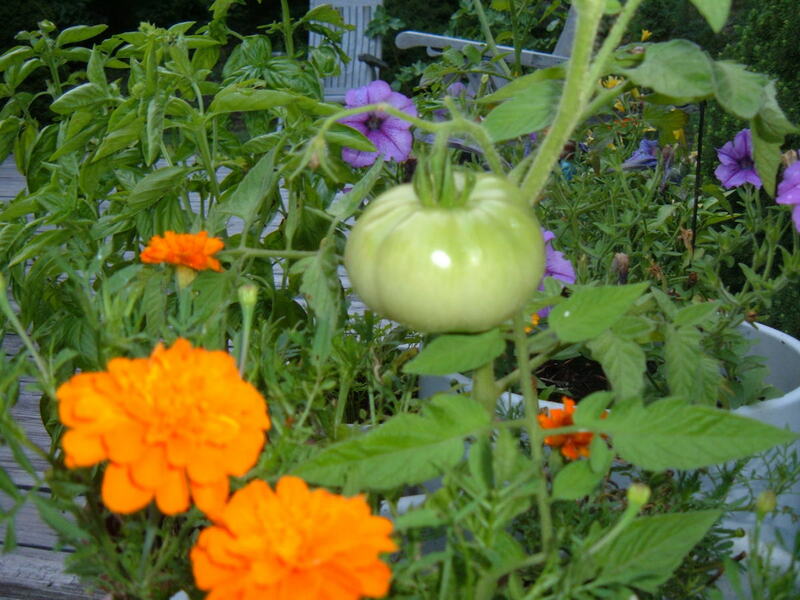 Home grown is so much better than store-bought that you will always grow some of your own. You may never buy store bought potatoes again! Growing Potatoes Organically in the Northeast U.S.A.
Hmm, I wonder if it is because you live in an area with the perfect weather for growing potatoes!